Welcome to Green Valley Cleaners & Laundromat! 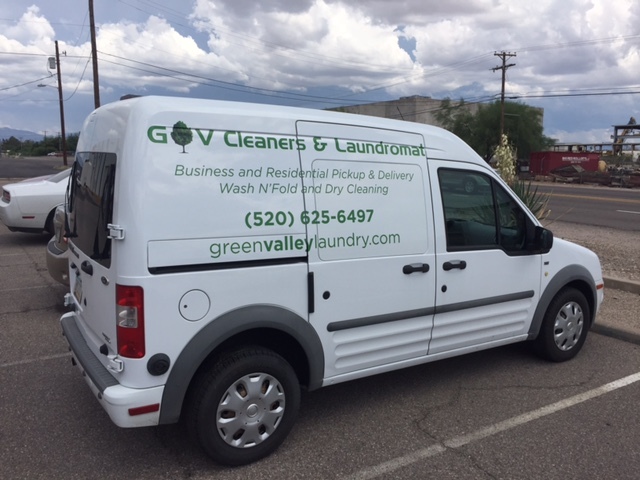 Green Valley Cleaners & Laundromat is your premier dry cleaners, provider of wash and fold services, and a coin operated laundromat. If you are tired of doing your laundry, need a nice outfit cleaned and pressed, or do not want to spend hours on your laundry and want to use our high capacity machines, we are your one stop laundering experience. We have proudly been in business for 40 years in Green Valley, Arizona!! Does your dry cleaner or wash and fold service have a loyalty program? We reward our loyal customers for staying with us with an excellent loyalty program! We serve customers from all over the area including Sahuarita, Tubac, Arivaca, Amado, and even South from Rio Rico and Nogales. You can bring your laundry to our shop for dry cleaning or wash and fold, or use our self-service laundromat/launderette. We have coin operated vending machines for all of your soaps and laundry bags, as well as coin operated snack and beverage machines to satisfy your cravings while you wait. Change machines are available. Our washers and dryers have multiple capacities to allow you to wash and dry large loads including comforters. Tired of washing your clothes? Try our wash and fold service. It is the perfect, inexpensive option for having your clothes washed, dried, and folded to perfection. Or if you need your clothes pressed or tailored, try our dry cleaning service. We are committed to providing the highest quality laundering experience for our customers by ensuring we deliver a quality final product and exceed our customers’ expectations of customer service. this site was designed by soccer cleat outlet site,read this post here.